Rapid Prototyping is one of the processes that are grouped under the general heading of Additive Manufacturing. Other processes available under this heading are ‘Layer manufacturing’ or ‘Solid freeform fabrication’ (SFF) processes. This process has initially been used in product development and is now starting to be deployed in rapid manufacturing. Many rapid manufacturing processes use industrial Lasers as an energy source. A new type of industrial Laser has appeared recently that is particularly suitable for metal processes. This Application Note explains why an industrial Fiber Laser is suitable for this application area and gives detail on its use in Laser sintering or selective Laser melting. The range of processes available under the general heading of Additive Manufacturing are also referred to as ‘Layer Manufacturing’ or ‘Solid freeform fabrication’ (SFF) processes. Early Additive Manufacturing applications were aimed mainly at product visualization but as the technology improves, component functionality has improved to the point at which parts are sometimes indistinguishable from conventionally produced parts. All these processes are additive, starting with only a flat plate and ending with a completed part. This is in contrast to conventional machining processes that start with a solid block and cut material away to form the 3D finished part. CAD technologies are essential for rapid prototyping; these processes are driven by instructions derived from three-dimensional computer-aided design (CAD) models. Laser sintering and selective layer melting are being used to produce tooling and even fully functional 3-D parts in metals and is the subject of this note. Stereo lithography uses low power short wavelength Lasers to solidify or cure polymers; but the functionality of the components is limited by the physical properties of the polymers. 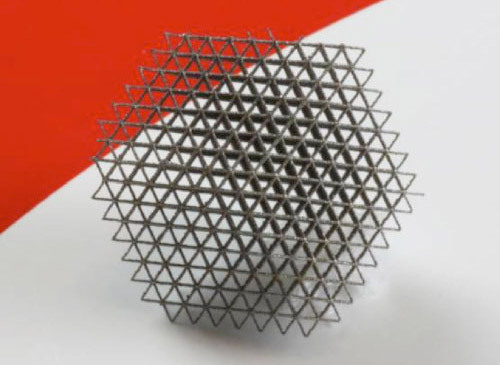 The ability of the Fiber Laser to produce square pulse shapes with a fast turn-on time and with continuously variable pulse lengths make it an ideal source for scanner based systems. This is unmatched by conventional solid state Lasers and leads to a stable sintering process. The high beam quality of the industrial Fiber Laser enables focused spot sizes of 30 – 50 microns to be achieved with long focal length lenses. Many layer additive processes use layers that are less than ~30 microns thick, often 230 micron. These small spots allow finer detail and lighter structures to be produced. Thermal lensing, the increase of focused spot size with changing Laser pump power, has plagued solid state Laser designers for many years. When a 9.5 mm diameter glass Laser rod is pumped with up to 10 kWs of flash lamp pump power, thermal gradients created in the rod cause optical distortions in the beam. In the case of the Fiber Laser, fiber coupled diode pumping and a very thin, long Fiber Laser resonator make it simple to maintain lasing at close to ambient temperature simply by conduction cooling. In RP processing, controlling heat build up in thin layers of deposited material requires sophisticated on-the-fly control of Laser power. With conventional infrared solid-state Lasers, thermal lensing makes this a far more complex problem. Beam intensity and stability allows high density of fill, and smooth finish. Compact system 6U in total size (200W – 400W CW). Shortening product development & build cycles for customised parts is critical in the highly competitive and innovative medical device industry; hence Rapid Prototyping is finding many applications. As a simple example, a rapid prototype model of a bone replacement, could be made and tested for suitability in a few days rather than taking many weeks using conventional techniques. Net-shape, high-value tools or metal components can be produced at significantly lower cost and shorter lead times in one-off or small batch production runs. Applications span the complete product life cycle from concept generation, through preparation of specifications and detailed design, to manufacture. This technology is appropriate for more costly, complex components such as aircraft part, naval and submarine components. The Selective Laser Melting Process is a developing technology which will build complex, pure titanium implants and components „while you wait“ using CT, MRI or CAD data files. In only 2 to 3 hours highly complex shapes such as solids, cylindrical mesh or lattice constructions as shown in figure 1 below can be realised. Fully automatic building process – parts overnight! 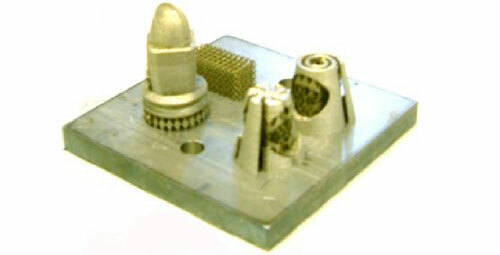 Fully finished components with surface finish as low as 30 micron RZ are readily achieved. Titanium is of particular interest to the medical device industry because of its combination of light-weight, good mechanical and corrosion resistant properties, its bio-compatibility and its aesthetic appeal. It is however a difficult material to process in the molten state due to a strong affinity for oxygen and the powders are therefore very costly. The stability of our industrial Fiber Lasers enables complex parts to be produced in titanium with the minimum amount of powder usage by reducing scrap and reject parts. Combining a high performing industrial Laser with a new Additive Manufacturing technique facilitates a rapid move forward in technology. 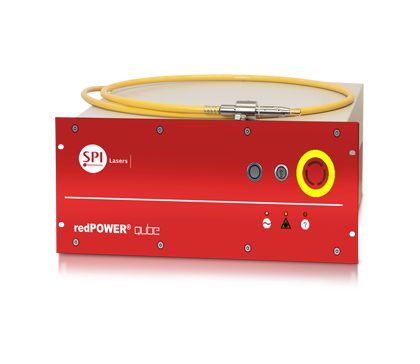 Industrial Fiber Lasers are now meeting the demands of existing and new Laser applications. The power stability and control flexibility of Fiber Lasers are significant factors in exploiting new, innovative applications. Industrial Fiber Lasers are here to stay in the most demanding of Laser applications.